Pennisetum setaceum is a grass-like graminaceous perennial. 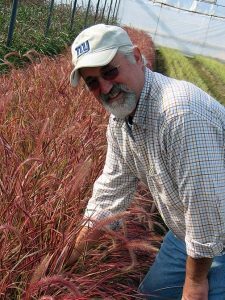 Pennisetum setaceum is the most important bedding grass in the USA, extremely popular because of its colour range. Pennisetum derives from the Latin word ‘penna’ which means feather or plumage and ‘sëta’ which means brush, so, feather brush. It is quite a logical name because the individual spikelets stay in a whorl of feathered brushes on top of the stem. A synonym for Pennisetum setaceum is Pennisetum ‘rüppellii’ a Latinizing of the name Rüppel. ‘rüppellii’ means: found by Rüppel or named after Rüppel. Dr. E. Rüppel, born in Frankfurt am Main(Germany) in 1794 was a famous explorer(investigator) of nature. Already when he was 23 years old(1817) and later on in 1822-1827 and once again from 1830-1834, Dr. Rüppel made long trips in Egypt; Namibia; Abyssinia and Arabia, principally for zoological purposes. During his trips he collected a number of plants under which the after him named: Pennisetum rüppellii. However, the official Latin name is Pennisetum setaceum. Pennisetum setaceum is a perennial grass with overarching slender leaves and bottle-brush flower spikes, becoming plumose with maturity. The nodding foliage looks like a springing fountain of foliage. Pennisetum setaceum Fireworks was found by Ron Strasko, owner of Creek Hill Nurseries in the USA. Pennisetum Fireworks is actually not a new breed but a mutation of Pennisetum setaceum Rubrum. The foliage of Rubrum is inflorescence rose-coloured. Pennisetum setaceum Fireworks is vegetativereproduced “in vitro” by ITSaul Brothers(USA). Pennisetum setaceum Fireworks is not as hardy as Pennisetum setaceum Rubrum and that’s why it is considered to be a Temperennial. The breeder recommends to cover the plant in Winter or keep the plant indoor during Winter time. 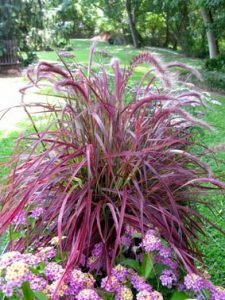 Pennisetum setaceum Fireworks show a fountain of luminous red foliage and is an eye-catching and must-have plant in the garden.